The vertical jump doesn't impress NFL scouts. They look at an athlete's power potential to put them in a superior class. The pros want a reason to put you in that class. This could be it. Highest vertical jump set in 2009. Donald Washington, Strong Safety for the Kansas City Chiefs. Leaping high into the air can help you become a better football player. High leapers can receive up-for-grabs passes, a Hail Mary, or block a kick, bat down a pass or bound over defenders. But, NFL scouts agree: the vertical jump is the most overrated test at the NFL Combine. Instead, scouts look for vertical power potential; the vertical jump is just the clearest way to determine it. Many players go about it all wrong. They practice under a Vertec Vertical Jump Trainer (the device used to test athletes' vertical power potential). That gets you nowhere. Don't train for the test, train your body to complete the athletic movement the test tests. Express your true power potential by developing a powerful jumping foundation. Every move you make in football requires power output. You can't express an exact motion of power that's going to be football-specific in terms of tackling and blocking. Start with basic power expressions, build on them and make it sports-specific. Bommarito Performance Systems teaches vertical jump exercises at the end of a training cycle because they are easiest to learn. BPS loves to use potentiation (power development; increased effectiveness). BPS potentiates power development with heavy, loaded lower-body exercises (split squats and elevated back lunges). When you develop neural activation (when workouts become routine) go right into power potential exercises. It's almost like a complex superset. Do a heavy set, immediately followed by one of the power exercises, take a rest period and repeat. The Variable Load Speed Box Squat series is only done once per week. BPS performs it once every 10 days because it's neurologically taxing. You do yourself a disservice if you try to execute dynamic box squats many times within a set (never do more than two reps during a set). Perform multiple sets (up to 14) with a 1-minute rest period. Allow the nervous system to regenerate, but never let it fully recover; keep rest periods short. Regeneration allows you to execute the same power potential for every set, to build power endurance over time. Band tension varies the load on the bar, but not the resistance. If you have 135 pounds on your back while standing, it's 135 pounds. When you squat down and stand up, it will be 135 pounds plus whatever band tension you have. Going down through the squat releases band tension; the bar becomes lighter at the bottom and heavier at the top. That variable load provides the acceleratory component of concentric power. 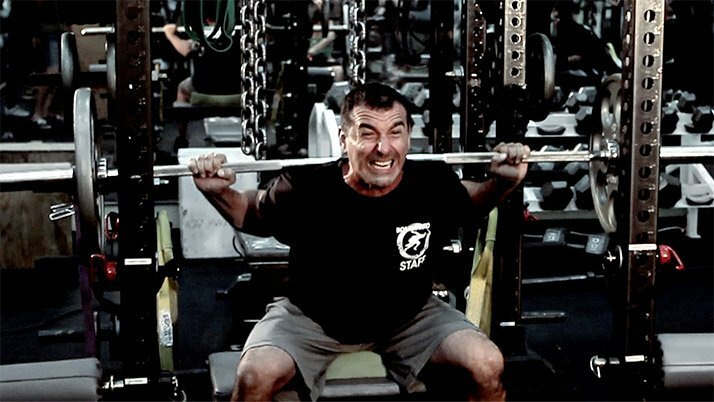 It's all about making the bar heavier as you rise from a squat to a standing position. Use these tempos to get the most out of the exercise. The first number indicates eccentric action duration, the second indicates the pause duration and the third indicates how fast you rise. You might not land properly after jumping under a Vertec. You don't want to continually load your joints by landing on the ground (jumping onto a box softens the blow). 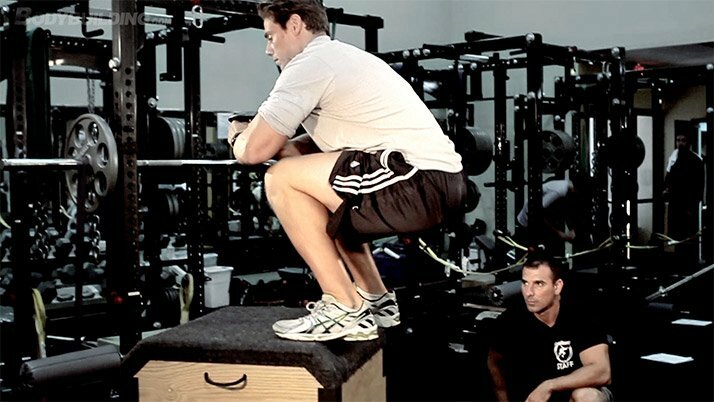 BPS uses box jumps during every lower body day. 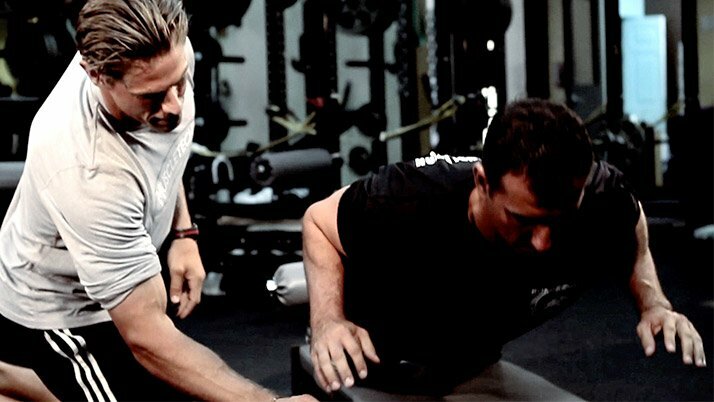 This technique is invaluable if you're training for the NFL Combine with only 6-8 weeks of preparation. Keep the reps short at 2-3 jumps per set. Execute 3-10 perfect sets without shuffling your feet through the decent or accent and try to micro progress week-by-week. Use the same foot and hand position as the vertical jump with your feet hip-width apart and your arms up, acting as levers. Shoot for full hip, knee and ankle extension with no bend in the shoulders. Drop down fast, throw your arms back and clear the hips. When your arms fire, the hips follow. The faster you descend, the faster your hips will move, which dictates the height of your jump. 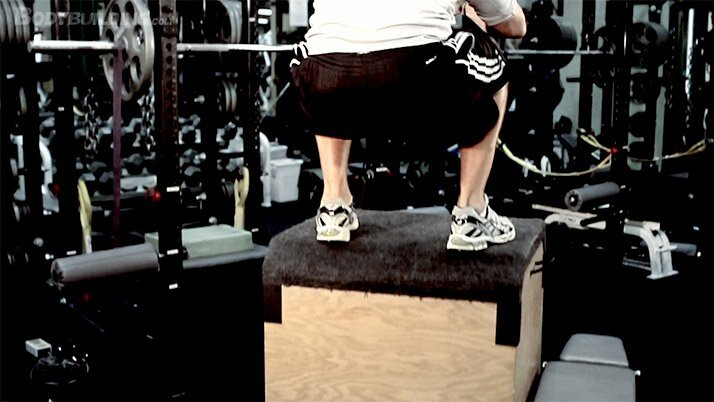 Dumbbell Seated Box Jumps are similar to regular box jumps. The only difference: you use pure concentric power, because there is minimal eccentric loading. You begin fully erect and descend into an eccentric load, using the stretch reflex as a huge component. The only stretch during a Dumbbell Seated Box Jump is when your feet slam down into a plyometric action (using a bounding technique and trying to limit ground contact time). Micro-progress the height of the jump and the weight as you become more experienced with the exercise. Adding weight makes the power expression more challenging and overloads the stimulus. Use weight that allows you to safely execute a jump. Never do more than three Dumbbell Seated Box Jumps at once. Perform one, rest and go again. The Linear Depth Jump introduces a safe base-line plyometric without much joint loading. A competent base strength, comprised of muscles in the hips, quads and hamstrings, is effective. A solid transfer ties everything together and presents a good opportunity to time arm rip (arms leading the legs out of the jump). Implement the Linear Depth Jump during the latter phases, after you've built a solid foundation. BPS adds Linear Depth Jumps during the last 2-3 weeks of a training period. Fall 12 inches off the box and onto the ground. As you fall, drive the arms into position. When your feet make contact with the ground you should be in the maximal jumping position with your arms back (hands clearing the hips). Punch the arms forward, use the same action as the box jump, and bound onto the box. Floor Glute Ham Raises strengthen knee flexors. It can be performed with no equipment (a partner can hold your ankles down). Eccentric loading during this exercise is crucial for pelvis control (watch for excessive hip flexion). Starting on a leg curl machine or doing glute ham raises helps hip flexion, but you want to maintain that hip flexion as you go through the knee flexion and extension exercise. That type of control is important and easy (use yourself as resistance). It helps people to micro-progress through the exercise. Knee flexion strength can be related to almost every athletic motion, but it's extremely important to maximize jumping ability. Bring your hips, with the whole upper body, down slowly and barely tap to pull yourself up. If you need the use of your hands, put them out and give a light tap on the ground to help push yourself back up.